Preliminary design plan for a light cruiser prepared in response to an oral General Board request of 12 June 1915. This design apparently was requested to investigate what capabilities might be provided on a much smaller displacement than that found to be necessary in the many larger "Scout Cruiser" designs being considered at the same time. This design resembled in size the much earlier Chester (Scout Cruiser # 1) class cruisers built under the Fiscal Year 1905 program but were intended to have been about six knots faster. 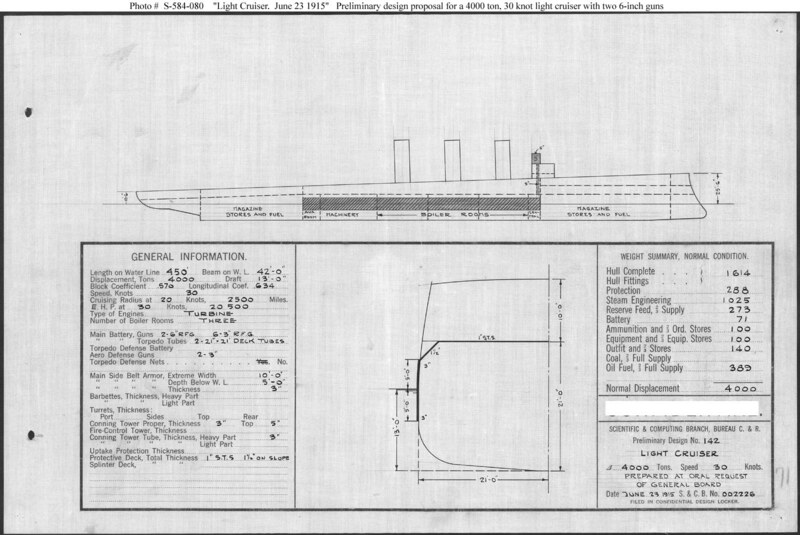 This plan provides two 6-inch and eight 3-inch guns, turbine machinery, and a speed of 30 knots in a ship 450 feet long on the water line, 42 feet.in beam, with a normal displacement of 4,000 tons. No ships were built to a design of this type.